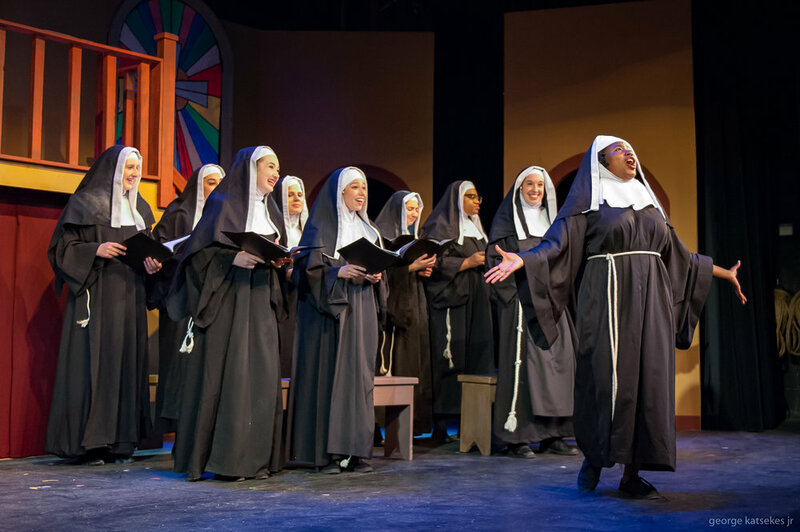 Deloris (Ashley Levells), whom the nuns know as Sister Mary Clarence, leads the nun choir in song in a scene from Sunset Playhouse's "Sister Act." Director Diana Alioto has this cast performing at a high-octane level, but none higher than Levells, whose Deloris delivers attitude in every song and move. She has all the star quality her character possesses. Levells loves the spotlight – as her character does – and vice versa. Every line is pure Deloris, as is every look, such as the look of smugness she wears when the monsignor tells the doubting Mother Superior of Deloris’ value to the convent. She can drip with sarcasm on a line like “Ain’t this my lucky day – I got a man who wants to kill me and a cop without a gun. Goody. Goody.” Or, really ham up a sequence, like the Lord’s Prayer she ad libs to the nuns, her version containing fragments of famous non-religious speeches instead of the usual text.